Summary: Four trials were conducted in 2008. In the screening trial Dual Magnum and the combination of Dual Magnum + Prowl H2O applied pretransplant gave good weed control and significantly reduced weeding time over Prowl H2O alone. Layby applications of Dual Magnum + Prowl H2O and directed applications of Chateau controlled 83 and 95% of weeds at 85 days after transplanting, respectively. By 134 days after transplanting, at planting and layby herbicide applications still had measurable reductions in weed pressure. 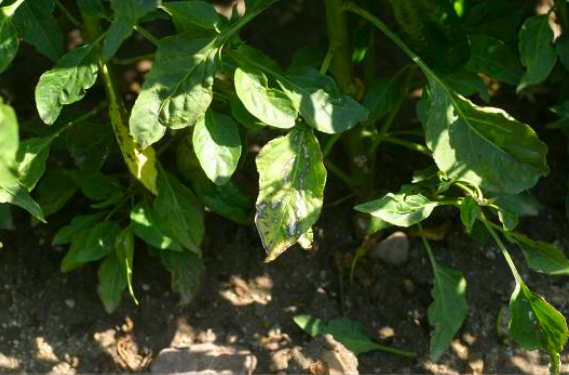 The use of Chateau as a directed spray on peppers looked promising, as it provided the best weed control and did not reduce yield. Follow up studies of this technique focused on the use of adjuvants that can reduce damage to peppers from directed sprays of Chateau applied at layby; these studies look promising and will be the focus of the 2009 evaluations. Methods: Trial No. 1: Trial was established in cooperation with Peter Iverson of Scott Anthony Farms near Soledad. The goal of this trial was to evaluate if Prowl and Dual Magnum could be applied post emergence to recently emerged direct seeded peppers to provide residual weed control. Peppers were direct seeded on March 1. The pepper field was treated with Gramaxone on March 24 to control the first flush of weeds; the pepper seedlings began emerging on March 26. The field was cultivated on March 31. Post emergence applications were made on April 3 and the field was irrigated on April 4 and 5. Each plot was one 40-inch bed wide by 15 feet long and replicated four times in a randomized complete block design. Applications were made to the entire bed in 74 gallons of water per acre with two passes of 1-8008E teejet nozzle at 30 psi. Soil type = Pico fine sandy loam. Trial No. 2: Trial was established with Peter Iverson of Scott Anthony Farms north of King City. Materials were applied to shaped beds on June 3 (temperatures in the 70's) and the field was transplanted the following day. See table 1 for pretransplant treatments. Layby treatments were applied on July 11 and were watered with sprinklers on July 15; drip tape was installed following the last sprinkler irrigation on July 15 and drip irrigation was used for the remainder of the season. 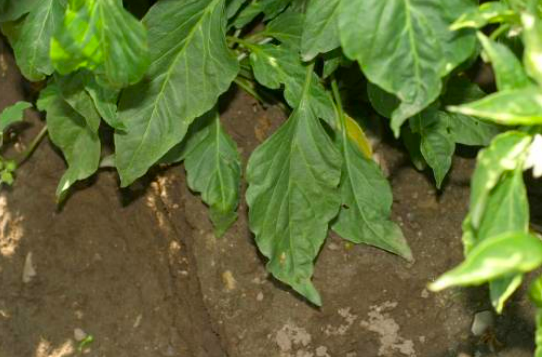 The trial area was not cultivated which is different from grower's standard practices. Each plot was one 40-inch bed wide by 20 feet long and randomized in a complete block design. Applications were made to the entire bed in 74 gallons of water per acre with two passes of 1-8008E teejet nozzle at 30 psi. Soil type = Pico fine sandy loam (pH = 7.0; organic matter = 0.78%; sand = 69; silt = 16% and clay = 15%). Trial No. 3: Trial was established with Kevin Vaughn and Jim Guidotti south west of Soledad. The goal of this trial was to evaluate the safety of directed postemergence applications of Chateau to established peppers. Peppers at this trial were Anaheim peppers (8-10 inches tall with first fruits forming); the site also had good Malva pressure. Materials were applied on July 15 as a directed spray to the base of the plants with three passes of an 8008E nozzle (one down the middle of the bed and one pass to each side). BreakthroughÆ, a silicone adjuvant that is thought to reduce plant uptake of a postemergent herbicide application when applied at high rates, was one of the treatments. Broadstar was spread by hand. The first irrigation following the applications was applied on July 20. Trial No. 4: Trial was established with Kevin Vaughn and Jim Guidotti south west of Soledad. The goal of this trial was to evaluate the safety of directed postemergence applications of Chateau and Goal Tender to established peppers. This was the same site as described in trial No. 3 except that the application was applied August 8 as a directed spray to the base of the plants. DC 1-6184 is a water repellent adjuvant that is thought to reduce plant uptake of a post emergent herbicides; it was applied at applied at 0.5% v/v in combination treatments with Chateau and Goal Tender. Results: Trial No. 1: This trial evaluated the post emergence use of Prowl H2O and Dual Magnum over the top of newly emerged direct seeded peppers. 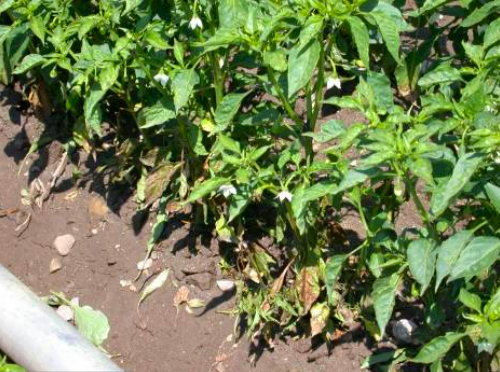 The idea of this treatment was to provide a preemergence herbicide following the emergence of the peppers to reduce weed growth during the early part of the growth cycle of direct seeded peppers. This was felt to be important given that neither Dual Magnum nor Prowl can be used preemergence on direct seeded peppers. The trial was evaluated for stand, phytotoxicity and weed control early in the growth cycle. The results indicated that there was significant phytotoxicity from Prowl H2O applications following the emergence of direct seeded peppers (Table 1). Dual Magnum was safer, but still had significant phytotoxicity. The trial was not taken to yield as the early season results looked discouraging. Trial No. 2: There was good weed pressure at this site. The main weeds were hairy nightshade and common purslane. The first weed evaluation date on June 25 measured the impact of the pretransplant treatments. Dual Magnum and Dual + Prowl H2O controlled 78-85% of the first flush of weeds following transplanting and reduced weeding time from 22.3 hours per acre in the untreated control to less than 13 hours per acre (Table 2). Prowl H2O alone did not provide as good of control as Dual Magnum as it is less effective in controlling hairy nightshade. However, it did a better than expected job of controlling this weed. Devrinol alone did not control the spectrum of weeds at this site effectively and took essentially the same amount of time to weed as the untreated control. On the second weed evaluation date on August 28 (85 days after transplanting) the weed counts reflect the impact of both at pretransplant and layby herbicide applications. By this time the weed pressure was low, but we were able to detect differences in weed control. For instance, all pretransplant treatments measurably reduced weed pressure 85 days after transplanting by provided 55-67% weed control (Table 3). It should be kept in mind however, that the trial site was not cultivated and that cultivation probably would have reduced the long-term effectiveness of pretransplant herbicide applications by disrupting the treated surface soil. Layby applications of the combination of Dual Magnum + Prowl H2O provided 83% weed control, while Chateau provided 95% weed control. Unreplicated plots of Broadstar provided 92% weed control on this date. On October 16 (134 days after transplanting), there was moderate weed pressure. There continued to be an effect of pretransplant and layby herbicide applications, however the differences between the treatments had disappeared (Table 4). There were no statistical differences in the yield of peppers except that there was a higher percent of green fruit in the untreated control than the other treatments (Table 5). Trials No. 3 and 4: These trials were started later in the growth cycle of peppers. Given the positive results that we observed in trial no. 2 with directed applications of Chateau on peppers at layby, we decided to apply Chateau with various adjuvants that may have the potential to reduce injury by Chateau to peppers. Both trials were observational trials and were not replicated. In trial 3 we used Breakthrough at a high rate, but there was greater phytotoxicity to the peppers from the use of this material (Table 6). In trial no. 4 we used the water repellant adjuvant from Dow Corning, DC 1-6184. Research in Michigan had shown that this material had the potential to reduce injury from layby herbicide applications. The desired placement of the herbicide is on the soil, but in layby applications it is difficult if not impossible to avoid contact with the foliage of the crop when applying herbicides. If the adjuvant can reduce absorption of the herbicide it has the potential increase the safety of layby herbicide applications. Unfortunately, we started the trial late in the season and had little opportunity to observe the efficacy of this material. The only evaluation we conducted was a yield evaluation to see if there was an observable effect of the materials on yield. In this preliminary trial, there was no deleterious effect of the herbicide applications on the yield of dehydration peppers. The impact of "water repellent" adjuvants will be more thoroughly tested in the 2009 growing season. Table 1. Trial No. 1. Stand count, phytotoxicity rating and weed count on two dates. Kerb and Broadstar were not replicated and not included in the statistical analysis. Phytotoxicity scale: 0 = no crop damage to 10 = crop dead. Kerb and Broadstar were not replicated and not included in the statistical analysis. Table 5. Trial No. 2. Yield evaluation on October 16.